Are you looking for an espresso and cappuccino maker that can serve you a delicious gourmet coffee drink and at the same time does not bust your budget? Then you may have found a winner because the De’Longhi EC155 cappuccino machine may live up to your desires. You should definitely keep reading to find out other important aspects like the Crema or the performance of the milk frother. If you haven’t heard of E.S.E pods that you can also use in this Espresso maker we just found another reason for you to stay on this page! Next to the pros and cons, the design and the cappuccino making process, we will cover it all! As many other coffee machines, the De’Longhi EC155 is framed in a black plastic case with a stainless steel front plate and drip tray. With a width of 7.50 inches and a height of a little more than 11 inches it definitely belongs to the smaller kind of espresso machines and will neatly fit under your kitchen cabinets. All available functions can be controlled with the black selector knob. A nice little extra that I like is the water fill level indicator right behind the milk frother to easily see when it’s time to refill the removable one-liter water tank. You probably need the manual the first couple times until you remember what the four icons mean and when to turn the function knob in which direction to start the swivel jet frother or how to make the espresso. But I can ensure you – you will get the hang of it quickly. From left to right you can see the Steam, Off, On and the Coffee/Hot Water Delivery Icon. Additionally there is an OK indicator light that illuminates green when the water or steam has reached the right temperature. In this section, you will learn how to make espresso, cappuccino and how to froth milk. So let’s not waste any time and dive right into it. At first you should know that the machine needs to preheat and you have two options to do that. The first one is to simply turn the espresso maker on and wait about 15-30 minutes. That’s how long it takes for the machine to preheat. Alternatively, you can preheat it more rapidly by following a couple steps that are described very well in the manual. The advantage of the quick preheat is not only to enjoy your cappuccino much faster it also preheats your cup when you reach the step to deliver some hot water into a cup. 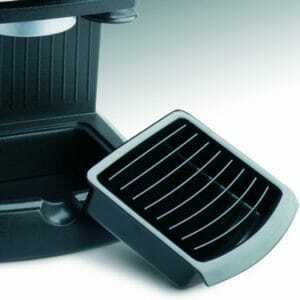 A disadvantage could be, that you may have a less hot and aromatic espresso. All right, let’s make some espresso. Now that you have preheated your machine, it’s time to fill the filter with some ground coffee. Make sure to tamper it thoroughly to get the best espresso experience possible. If your crema is too dark you tamped too much. Is the flow of the espresso too fast and the crema is little to not existent the grounds are not compressed tight enough -> use more muscles! Check that the OK light is on, then attach the filter holder and turn the selection knob to the furthest right position. Too dark crema? Now you tamped too hard. Thanks to the patented dual function filter holder from De’Longhi you can use E.S.E pods for a more convenient way to make a cup of espresso. E.S.E or Easy Serving Espresso is a standard that is accepted by many pod producers and makes it easier for you to create a quick espresso without the need of tamping or measuring. Regular coffee pods are larger than E.S.E. pods so you can’t use them in machines that support E.S.E pods. Getting a cup of espresso with a pod is quick and easy. Just insert a pod in the filter, attach it and turn the selection knob to the furthest right position. Done! Since you know already how to make an espresso we focus now on the milk and how to froth it to create a creamy cappuccino. Watch the video below how the guy makes art with the De’Longhi EC155 and milk froth. Are these two hearts? Beautiful! At first switch the knob to the furthest left side to the cloud icon to preheat the steam boiler. In the meantime prepare a large enough frothing pitcher and fill it up with some cold skim milk. The OK light should be on by now so let’s start with the frothing process. 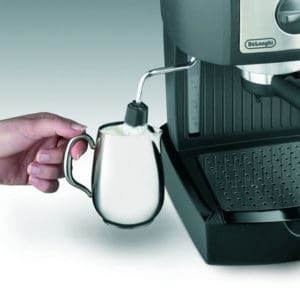 Dunk the swivel jet frother in the milk for about a quarter inch and release the steam by turning the steam knob. When the milk starts increasing in volume dunk the frother completely in the milk until it reached the perfect creamy texture. Carefully pour the froth into the espresso and your cappuccino is ready to serve. As we have already learned you can use regular espresso coffee or if you prefer the quick and convenient way, just take an E.S.E. pod. I still recommend the regular freshly ground beans because the flavor of the espresso is even better. You don’t need any paper or permanent coffee filter with this machine. 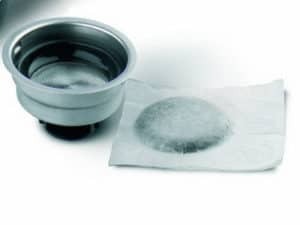 All required tools are already in the package which are the filter holder, a small filter for 1 cup or pods and a large filter for 2 cups. Under the hood is a 15 bar pressure pump which is more than enough to create a nice thick layer of crema on your cup of espresso. However, no more than 8-10 bar is necessary for the water to be pushed through the espresso. You may have expected it and yes you are right. 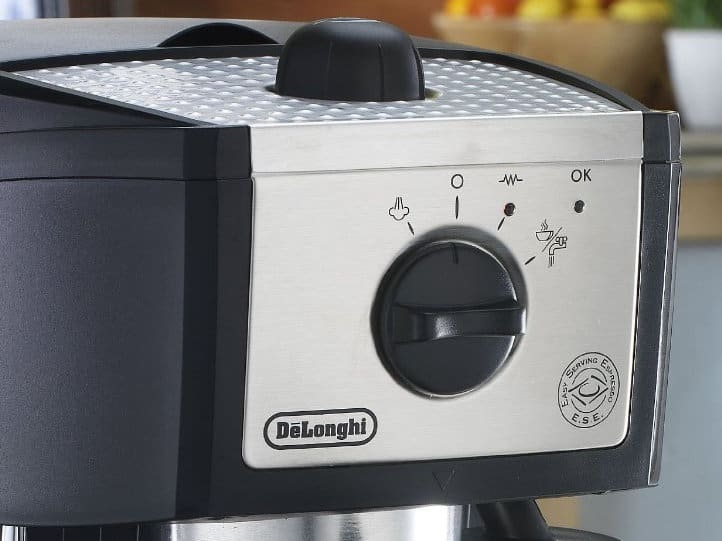 The De’Longhi also needs some attention regarding cleaning. It has no automatic cleaning feature so you have to roll up your sleeves and clean it with your hands. However, it does have a self-priming operation which eliminates tedious start-up preparations. To give you a better understanding how much effort it is to get the cleaning job done I will explain to you what to do. The DeLonghi EC155 Espresso and Cappuccino Maker is a great option if you want to make the switch from a drip or single-serve machine to the espresso world. The flavor is smooth and delicious, the frother creates a creamy milk froth. Yes, the machine has a lot of plastic but for an entry-level machine below $100 the De’Longhi EC155 can compete with much higher priced Espresso Maker. 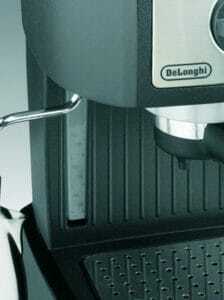 Do you have the De’Longhi EC155 or a better alternative? Then I would like to hear from you what you think? Please leave a comment below.